The internet and building your own website has become more freely accessible, to a point where you need limited or no coding ability to create your very own website that looks great, performs well and even has some complex functionality. The driving force behind this kind of ingenuity is the open source community, who are kind enough to develop tools for the everyday web owner or hobbyist. However these tools have become so popular and so powerful, they have become viable options for small to medium size businesses and even large corporates in certain instances. An open source CMS is not just a place to run a blog anymore it's become a powerful eCommerce platform. Open source is basically a crowd build platform where there are a lot of people working on the software. Anyone and everyone who wants to can log a change, fix a bug, create code, help with user guides and instructional content. A community of individuals contribute, test and making sure the code is solid and that the software is easy to use. These community members are normally really friendly and helpful and its great for first-time website owners to get involved in. New code and features are constantly being built. Documentation is usually easy to find, and there are plenty of people out there writing “how-tos,” which make design and development easier and even fun. You can get help from multiple sources, youtube, forums, blogs, slack chats and even physical meetups. The downside of open source? Irregular updates or no updates at all as projects become abandoned. many people are familiar with open source code, which creates a higher risk for hacking. Released in 2003 and has become the most popular CMS in the world and holds that title with the fact that its powering close to 26% of sites on the internet. 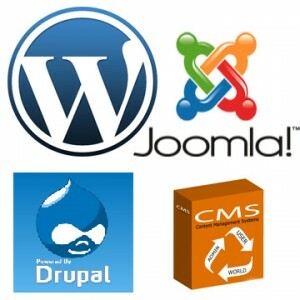 The oldest of all on the list is Drupal, this 16-year-old PHP based CMS has had 8 major releases since the year 2000. It may not be as user-friendly as Wordpress and Joomla but it is more robust and capable of creating rather complex and heavy data driven and traffic laden websites. Currently running 772,992 active installs with over 62% of them being in the US. Joomla as with the other 2 Open Source CMS's making up the top 3 is also based on the PHP framework and has been around for 11 years with its release in 2005. Since then it has managed to attract 2 523 734 websites to run on its platform with the US and Germany making up over 50% of Joomla run sites. Released in 2015 and has around 2419 active sites using the system. Is a ruby on rails based CMS that lays the claim to a 5min website set up. Mokio was released in 2014 with most of its adoption coming from Poland. Release in July of this year Concrete5 is a new-comer to the CMS family but don't be fooled this PHP based CMS already has 83 898 active installs with 55% of those being US-based websites. Another newcomer is the CMS SilverStripe which launched in October of this year. Still, in its infancy, the CMS has already racked up 30 852 active sites running on its software and growing. The US, Germany and the UK have been major adopters of the platform with a combined 67% of SilverStripe sites running in these countries. Another PHP based CMS that's taken things back to basics and is very similar to Wordpress, October CMS is now 2 years old has amassed 5548 websites on its platform.